As Hannah Peel and Tubular Brass perform in Liverpool in a unique collaboration, Getintothis’ Rick Leach catches up with them to talk about brass bands and journeys to outer space. The end of September 2017 promises to be a special time. 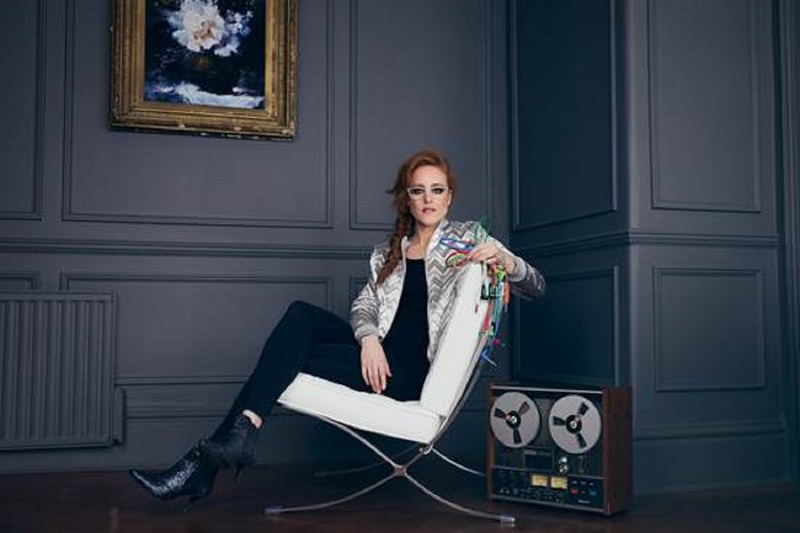 Not only are we being treated to a brand new solo album by acclaimed electronic musician, Hannah Peel, the follow-up to her 2016 Awake But Always Dreaming, but she’ll be playing it live at Liverpool’s Philharmonic Hall, the very day after it’s released, September 23. Furthermore, because the album features a full brass band, they’ll be accompanying her on stage in what promises to be a unique performance of live synths and brass in a concert setting. 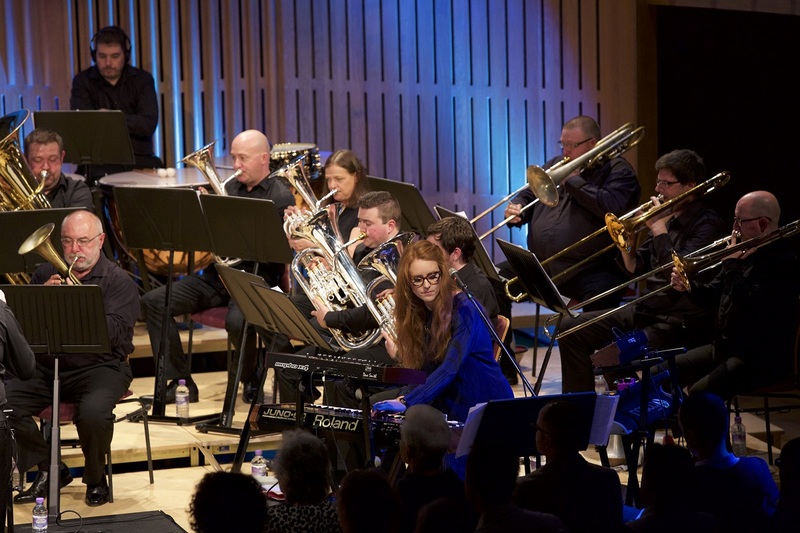 The brass band, Tubular Brass are a thirty-strong ensemble who’ll be playing in full their setting of Mike Oldfield’s classic Tubular Bells album. The whole thing arranged for a full brass band. It has all the hallmarks of something that might literally blow your socks off. We caught up with Hannah Peel to find out about the new album, Mary Casio: Journey to Cassiopeia, to talk about sources of inspiration and how she’s brings her ideas to fruition. But before that we chatted with Sandy Smith, the leader and founder of Tubular Brass, about how and why he decided to bring Tubular Bells to a brass band setting, the reasons for listening to new music and why brass bands are more than worthy of our attention. Sandy Smith has had a long and distinguished career as a musician, arranger and conductor. He’s played for the top brass bands in the world, was part of the Acid Brass project and arranged and scored music for the 2012 London Olympic opening ceremony. It was clear as we talked that Sandy has a passion not just for brass bands but all music and is very keen to open up what may be seen as the closed world of brass bands to a wider audience. Getintothis: First off, I feel I should really explain that while Getintothis covers a wide range of music, of all types and of all times, I don’t really think that we’ve done much about brass bands. Why should our readers be into brass bands and more importantly what is the appeal of brass? Sandy Smith: “Right. Well, I’ve been in bands since I was a kid and played in bands like Black Dyke and Faireys and Grimethorpe and conducted bands like Brighouse-big bands, really big bands like that. People still have this conception of them, well, being the Brassed Off film you know, flat caps and whippets and all that but there’s a lot more to it than that. I think one of the beauties of what we’re doing with this thing- the Tubular Brass and Tubular Bells– we’re actually using the brass ensemble as a vehicle, if you want to put it like that. but it is the music we’re trying to make a connection with. I was lucky enough to play with the Fairey Band in the 90’s when we did this thing called Acid Brass-the one with Jeremy Deller– and I was a player at that time that was a similar sort of thing. We were taking it to an audience who wouldn’t normally listen to brass. And with this Tubular Bells thing a lot of the people who are coming to hear it aren’t brass supporters or enthusiasts but what they are, is that they are Mike Oldfield fans. So they’re coming to the gigs with that level of comfort with the music. They’re just listening to it but constructed in different way. The brass can sound spectacularly brilliant and really loud or it can sound really intimate and gentle as well. There’s a huge range of sorts of tonalities from it. Getintothis: Would you say that brass is a misunderstood type of music? Sandy Smith: “It used to be. Before popular entertainment really kicked off in the 50’s and 60’s with the rise of television, bands used to play in parks and played popular tunes. And it was a way of getting people to hear classical music as well. That’s all changed now and bands have lost a lot of that connection. I still think that if bands choose their repertoire carefully that it could all turn around. A lot it is the bands fault as they think they’re above it all, you know playing stuff that people know, but I had the privilege of paying in Faireys with that Acid Brass thing and it worked! Getintothis: It’s a big Northern cultural thing brass bands, a big working class and Northern culture that’s not shouted about enough maybe? Sandy Smith: “Well, I think some of the bands need to take the rap for that. A few of my mates…in fact one of my mates, Mark Frost, who is in the Tubular Brass band and plays trombone, he plays in bands all around the world. He does soundtracks and film scores in America and he’ll play whatever he’s asked to play-yet some of the bands, they only play what they want to play and don’t think about how they can appeal to the public sort of thing. I think this is just a way of doing it. I’ve always wanted to do Tubular Bells. I’m in my mid-50’s now. I grew up with it and always had a hankering for it. I started arranging for brass when I was 14, 15 years old. I always wanted to do this and obviously I didn’t have the skills at the rime. But things have worked out and we’ve done it! It was a hell of an undertaking but it seems to have worked. Getintothis: There’s 30 members in the band. Had many of them heard Tubular Bells before? Although it was a very popular album and remains so, I think for a lot of younger people it will have passed them by. Did you have to sit them down and make them listen to it? Sandy Smith: “Well a lot of the band about my age or slightly younger knew it. Brass payers are drawn naturally to instrumental music and music without vocals that’s played in a group situation always helps. But certainly some of the younger players in the band hadn’t heard it so yes, I made them listen to it and research it. But it’s such an unusual piece of music as well. You remember that when it came out it was two sides on an LP. The only reason there was probably a break in the music was that he ran out of space on side one, so that’s how I’ve done it. There’s two parts to it. One long part- which is side one- and one that’s only slightly shorter,which iss side two. We shouldn’t forget that Mike Oldfield was only a teenager at the time. He cobbled it together through various tape recorders in a Heath Robinson style and made it work! But he had a bit of breakdown afterwards because it was a huge, huge success and he didn’t really like the limelight and the adulation and the fame. He became a bit of a recluse and the piece never really got played live in full until relatively recently. Getintothis: It sounds quite different doesn’t it? Sandy Smith: “It had to do. Well, I was trying…first and foremost I had to try to make it work for brass rather than recreate his sounds or anything there didn’t seem much mileage in that. Unless you’re playing it on the instruments for what it was written it’s going to sound a bit naff so I was trying to all the time all to make a brass version of it sound as authentically brass as I could. Getintothis: It’s a difficult balancing act, I guess? Sandy Smith: “Oh it is! I used a range of computer software. Oldfield rerecorded it in 2003 with 17 different tracks so I used that as a basis, writing 17 different scores and starting with the ones that I thought would be the easiest at first. I then kept mulling over the harder ones and tinkering with them over and over again. It took about six months constantly working on it at weekend and evenings to get it together. I thought that one of two things could happen. It would either be people thinking “what the hell do you think you’re doing, it’s useless, it’s a stupid idea?” or they’d think that it was such a wacky and leftfield thing that they might actually like it and I think thankfully that’s what has happened. Getintothis: Tubular Bells is not really a prog album though is it? When you think that Yes, Genesis, ELP and the rest had that R & B, Stones, Yardbirds background, Mike Oldfield really didn’t and began with a blank canvas. Sandy Smith: “It gets kind of lumped in and thrown in with prog. Because there’s are so many branches to prog that it’s easy to think of it that way. There was just something about it at the time. There was a folky element about it at the time-his sister was into that- but he was different. He was a bit of a loner and very much his own person, even at 19. Getintothis: Have you been in touch with him? Does he know you’re doing this? Sandy Smith: “He does know. We did contact at all the relevant people to get permissions and all that, which didn’t really involve him directly. But we have found since we started doing it we’ve found that people are coining to the all concerts who are proper super Mike Oldfield fans, real afficiandos who have been taking videos and posting them. He’s seen them and likes them and he’s saying he’d love to hear the whole thing. So even though we’ve got the permissions, we’ve got his approval on all of it which is great. Getintothis: I can imagine! How does it work playing with Hannah Peel and her Mary Casio stuff-how does that fit? Sandy Smith: “Hannah got involved cos basically we needed another half to the concert and we were put together by a convert promotor who’d worked with me when I’d done some live brass arrangements for The Unthanks and who knew Hannah as well. Hannah is from Northern Ireland but grew up in Peniston which is literally a five-minute drive from me. And she played in a brass band- she played the trombone. So I met Hannah in January 20l6.and she had this idea for this synth piece. What came to pass was that Hannah did all that side of it and she provided me with basic scores of it all which I then scored for brass. She had ideas in her head as to how she wanted it to sound, you know? Big and majestic or intimate and gentle and I basically did all the scoring. We kept working on it and we did our first performance in May 2016. And it’s all up and running now and it sounds great! Her album is out on September. It does sound so good. When she gets her synthesisers going and with a big bank of speakers and the brass as well, it’s really powerful. .Getintothis: I think a new audience may be surprised how loud and powerful brass band can be. Do you think it can attract a new range of fans to brass? Getintothis: I always think you’ve got to give new music a chance. Even music that you haven’t heard before can be new music to you. Classical music is a prime example. It can be so powerful and moving and a lot of people are turned off just by the idea of it. Getintothis: You have to give it a go. All new music. Apart from opera. I’ve really tried with that but can’t get it. It just leaves me cold! Getintothis: Have you played the Phil before? Getintothis: A lot of people are talking about the concert. There’s a lot people going who wouldn’t normally go to see a brass band at the Phil. Getintothis: What’s next after these concerts? Sandy Smith: “I’ve started looking at other prog stuff and doing other collaborations and especially after WOMAD and Bluedot. I’ve been looking at Genesis, Pink Floyd, Yes and King Crimson. I’ve already done Genesis’ Watcher of the Skies and King Crimson’s 21st Century Schizoid Man. I’m working on some Yes stuff. So we’re looking at being able doing a full prog concert as Tubular Brass is only really half a concert- but I’m well open to other suggestions. All this stuff all the prog stuff wouldn’t work with a normal brass band audience ‘cos it would be too alien to them. I really want to tap into a different audience altogether..
Getintothis: Because there is an audience for new music out there isn’t there? In 2016, Hannah Peel released two great albums. 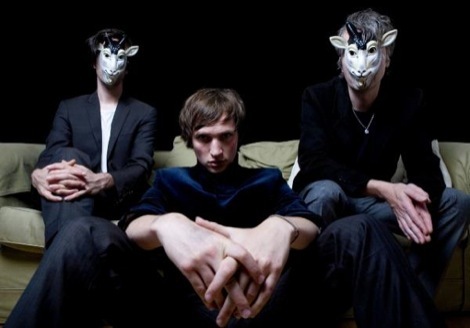 The first was her one as part of The Magnetic North, The Prospect of Skelmersdale, an album that rightly made many of the Album of the Year lists. She didn’t hang around however and issued her solo album, Awake But Always Dreaming later in the year. Again that album was highly acclaimed, not least for the way it dealt with the central theme of how her own Grandmother succumbed to the heartbreaking disease of dementia. 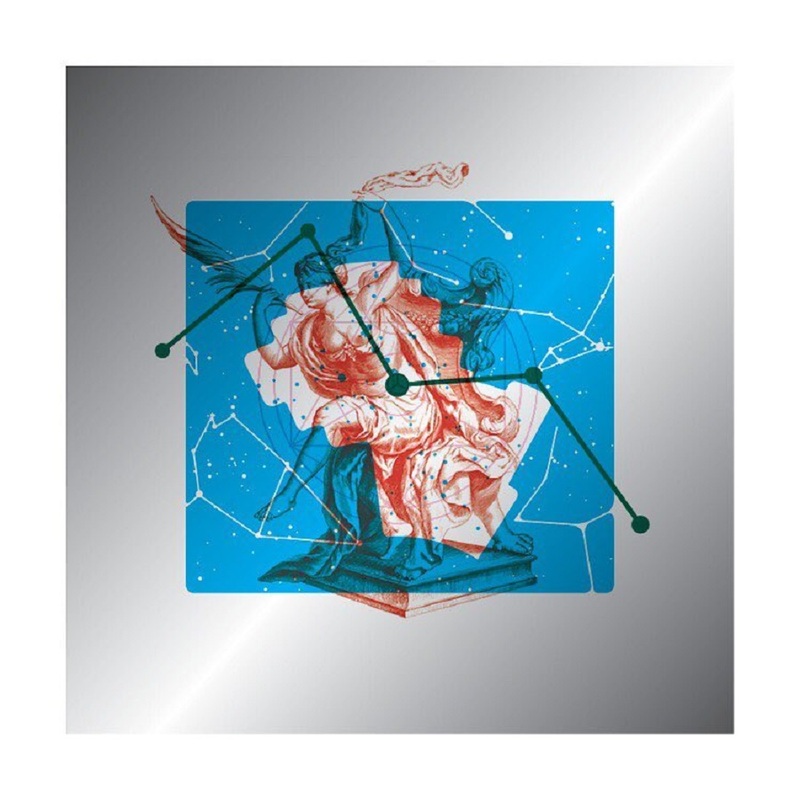 Hannah Peel is not one to let the grass grow under her feet however and she’s back with a brand new sparkling album, Mary Casio: Journey to Cassiopeia which is seemingly the story of an 80 year-old woman from Barnsley who travels to a star system light years away. As ever, Hannah Peel was very gracious with her time as we asked her about this record, working with a full brass band and even whether she’d consider playing any metal songs. It’s obvious from the amount of music she’s making and the work that goes into it that she has a lot to say. She’s clearly someone who thinks deeply about what she does and the whole creative process yet it must be said that, she always does it with a great sense of humour. Laughter is the order of the day when you’re chatting with Hannah Peel. And isn’t that a good way to be? Getintothis: Mixing brass with synths. Was it your idea? Why did you think it would work and how did you get the idea for it? Getintothis: So where is Dobcross exactly? Hannah Peel: “It’s all around Saddleworth, All the villages of Saddleworth play a big part of the marches and you’re not allowed to drive. You have to walk to each village and only the coaches and brass bands are allowed to go into the villages. In each village you have a strip of road that’s for the marching part. Once the bands have marched they get adjudicated and go from that into a beautiful square or school and then they play their competition piece. They get marked and whoever gets the highest score wins. So I waited until we saw a Championship section band-I think it was Brighouse and Rastrick, I think- and I said to East India Youth, this is going to be amazing, these are the top, top players in the world for this type of music. Anyway we went and I did an Instagram post that said “Electronic music meets brass”. The guy that commissioned me to do this piece saw that post and he was connected with Tubular Brass. He thought it would be lovely to have a piece in concert that could run before Tubular Brass. I knew I’d would love that because I love analogue synths and I grew up playing trombone and doing all the marching and playing in brass bands. So…it was really exciting and so I said yes! Hannah Peel: “Yeah! I suppose it was electronic pieces that I started with and improvised and they were all started and finished in one day. And I played around with this little character in the studio. It was based in the beginning about getting my Casio keyboard out and putting my glasses on and dancing around the room! And from that it developed into so much more! Getintothis: So it worked out alright! And this Brass Band thing is a real Northern Working class cultural totem. I was wondering about the connections between that and how brass instruments in music are treated differently in the US. Is time for brass bands to be reinvigorated and maybe how you’re doing it is a way to do that? After all, you probably wouldn’t get a brass band filling the Philharmonic Hall with the type of audience you’re going to get for your concert. 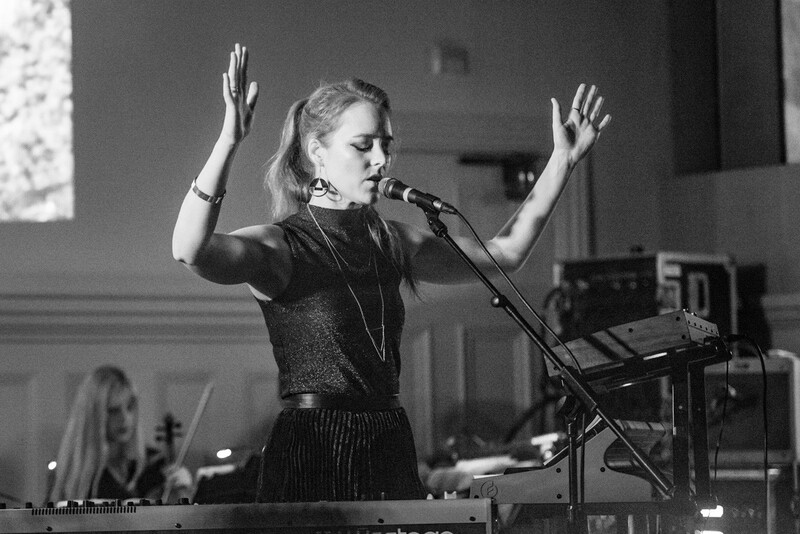 Hannah Peel: “It’s funny…when you see it live or when you’ve got it on full blast with really loud speakers…there’s something magical about the resonances between the synthesisers and the breathing of the brass band. The melancholy mixed with the power is incredible. It really takes you do a different place and I can’t believe that it’s not something that hasn’t been done before. Yeah, I can’t believe that since analogue synths have been around and Tubular Bells as well, that it’s not been explored before. It feels really magical. But it works so well. I feel so privileged to be allowed access to these marvellous players and conductors. It’s really special for me. Getintothis: I think it’s going to be a really interesting the concert at the Phil. Moving onto Mary Casio, exactly where did you get that idea from? Where did it spark from? Was it just a little spark? Hannah Peel: “Yeah, it was simply a tiny spark! I dunno really. I suppose it’s quite political in some sense because she’s Northern and with what’s happening and what’s been going on in the last year with leaving the EU. It just felt like here’s this 80 year-old woman, who’s a bit like my Great-Aunt. She’s (Mary Casio) never left her home town, she’s never really been anywhere else and she’s always dreamed about going somewhere else. She’s been stargazer and so she makes this journey. She goes to this place she’s always dreamed of. The last piece of the record is a recording of my Grandad in 1927 singing in a choir in Manchester Cathedral and it finishes the whole album. There’s not a piece called Cassiopeia. It didn’t feel right that there was one! Getintothis: I can’t wait to hear it! Getintothis: You have a strong interest in science. There’s been a lot of stuff on the last album and now this new one that’s very connected with science. Is that quite unusual for an artist to be that interested? Hannah Peel: “It’s funny. I suppose so. You think about Bowie and the things that he did and there’s a lot of connections between music and science. Getintothis: But you do a lot of research as well? Hannah Peel: “Well, I do and I enjoy it! I do look into things a lot. I always go and find someone and talk to them. For example, for this album I went to see the Head of the Royal Observatory in Greenwich who just happens to be from Barnsley! So via some connections though the girl I worked with on the last album, the neuroscientist, I went and met him and had a great conversation about the connections between the cells in the brain and how much they look like the universe. We discussed how we’ve spent and how we will continue to spend years exploring outer space, but we don’t explore the most impressive biological discovery-which are our minds. So we had a wonderful conversation and we’ve been in touch a lot since and it’s really helped form my ideas. When I wrote it, well I didn’t write it knowing all this. It was more of, I’ve just got to get it out and then finding like the last record, you have to do that. You then have to stand back a bit and analyse it from afar and be able to look at it properly”. Getintothis: It seems to me that you’re not content at dabbling with it at the edges. You’ll not just glance at Wikipedia or do a quick Google search and think that’ll do but you realise need to get quite deep into it all. Would you be interested in finding out about all his even if it wasn’t for the music? I get the feeling that you would be! I suppose I get so obsessive over it. I suppose I go on a trail and obsess over it. I get kind of … I delve into it and get carried away with it. I watch a lot of documentaries and read a lot and some things go over my head and some things really stick. Getintothis: Do you do the research and then make the music? Is it mixed up or is there a starting point? Getintothis: You have to be fairly self-disciplined? Is it different than working with a group, say with your work with The Magnetic North? Hannah Peel: “Well, yes of course, but for this album- and we recorded it very quickly- I had the expectations of 29 people and Sandy. I had to get it in for a certain time and we had to do the premiere and we did that six months before we actually recorded it in full. Listening to the very first recordings and developing those ideas and talking to the band is what really helped. You don’t get that opportunity very much! It’s like going back to the old school days. You don’t get that chance very much- to rehearse and then talk and rehearse and then record it. So for the Magnetic North we generally compose and produce as we go along. We don’t get the opportunity to play it all first then then record, but we’ll probably do that for the next record. Getintothis: This album and Awake But Always Dreaming are quite literary pieces of work and maybe they could quite easily be translated from music into a novel. Is that a fair assessment? I mean I’d love to read the Mary Casio books as it sounds like a fascinating story in itself! 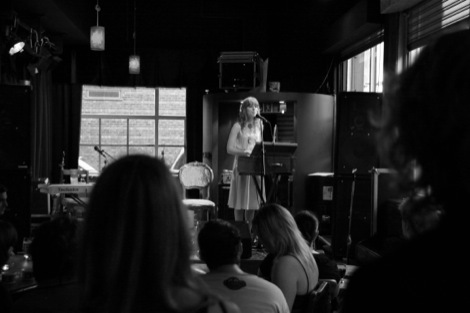 Getintothis: Is there a fine dividing line between the music you make and literature? You read a lot? Hannah Peel: “Yeah, and I love theatre as well. Getintothis: So there’s a definitive narrative to the album? Getintothis: I’ve been thinking about all the music you make and it seems so very much unrock and roll and you’re so removed from all of that rock stuff. You mentioned about doing three-minute pop songs and it’s a real breath of fresh air way from the worm out tropes of guitars and thrashing away and 1-2-3-4. I can’t think of anyone who seems less rock and roll and the music you’re making as Mary Casio. Do you ever feel like just playing a heavy metal song? Do you ever get that hankering for that? Hannah Peel: “Yeah! And bizarre as it sounds The Magnetic North does that for me but I love all sorts of music. I really enjoy listening to all the old bangers and classics and that’s something we do on tour quite a lot, just to get us through the driving and those big classic albums and all that. I don’t know what it is, but I don’t seem to steer towards making that sort of music personally. I’m thankfully not in a position where I have to produce that type of music because I release everything on my own label. I haven’t got a record label over my head saying you’ve got to do this because it will sell and we’ve got to make our money back. I haven’t got that reliance and it gives me a lot more freedom. It’s got its pros and cons doing that but for me it’s like I like can just go where I want to…and where I feel like and I guess say what it means to be me, without really scaring people! Getintothis: You’ve always written in the third person. Would you ever consider writing on the first person? Do you ever think of writing of yourself or are these characters going through you? Hannah Peel: (Hesitates) “… well… they’re going through me ‘cos they’re what I feel. It feels like when your writing from that perspective you’re inviting the listener to go on that journey with you, rather than you just saying “me, me, me, me” all the time. For me it feels like more rewarding to invite people along- to say that this is the story and if you want to be part pf that then that’s great and I suppose that’s a tool which a lot of novelists would use. Getintothis: Do you feel like this story (Mary Casio) is a lighter story? Is there that same sense of catharsis? Hannah Peel: “Well, It’s definitely a development of the last record in terms of the brain. The last record ended with delving into that world and that of the imagination and this one has gone deeper into that world. Getintothis: What’s next for you after Mary Casio apart from The Magnetic North? Have you anything in mind? Don’t give too much away, but can you give us a clue?! Hannah Peel: “You know you have the prequels of Star Wars and Alien, all sci-fi stuff? Previous ArticleSoundcloud – Too Big To Fail?